RELEVANT DISCORD is a modern rock act whose roots find ground in the raw angst and energy of the post-grunge movement yet whose branches of sound find distinction with the beauty and tension of string work and occasional dissonant elements. Lyrically, RELEVANT DISCORD's work captures a depth, intensity, and honesty often found absent in many mainstream releases. All the while, RELEVANT DISCORD offers listeners a finished product possessing both independent and commercial appeal. Initially founded in 2002, RELEVANT DISCORD is fronted by Nicholas Andrew Depew (published author of: “Character in Transition - A Guide to Not Burning the Bridge”). Nicholas is the only official member of RELEVANT DISCORD. However, a skilled cast of musicians rotate in and out of the band as support for live events and studio work. Between 2005 and 2007, RELEVANT DISCORD began writing and compiling songs for what would become their debut release, December of 2009's “The Pathways of Brokenness - Volume 01” EP. “The Pathways of Brokenness - Volume 01” EP was recorded and mixed with father/son duo, Eddie and Jai Callahan (respectively) between 2008 and 2009. Eddie, both a musician and producer, has played with and/or opened for a virtual who's who of rock music's elite from the 60's, 70's, and 80's. Some of these artists include: The Doors, Janis Joplin, Bob Marley and The Wailers, Heart, and Eddie Money. Eddie's son Jai lent his drumming talents to four of the EP's five tracks. Jai is presently in high demand as a touring musician among a number of independent and small label bands located in the Pacific Northwest and West Coast regions of the United States. “The Pathways of Brokenness - Volume 01” EP released on December 8, 2009. It featured the songs: “The Refrain,” “Today We Remember,” “Law of Constants,” “The End of Silence,” and “We're in this Together” (a cover of the 1999 alternative/industrial hit). In March of 2011, RELEVANT DISCORD re-entered the studio in northern California. However, this time enlisting the co-production assistance of industry veterans Sylvia Massy and Rich Veltrop. Sylvia was the producer/engineer behind notable projects, including: TOOL's “Opiate” and “Undertow,” System Of A Down's self-titled release, Powerman 5000's “Tonight the Stars Revolt,” the Red Hot Chili Pepper's remix of “One Hot Minute”, and songs from Johnny Cash's “The Legend Of.” Rich has engineered/mixed projects for artists including: Rage Against the Machine, Tom Petty, Slayer, Spinal Tap, 311, Buddy Guy, and David Coverdale. Rich has also worked alongside several award winning producers/engineers, including: Rick Rubin and Butch Vig. 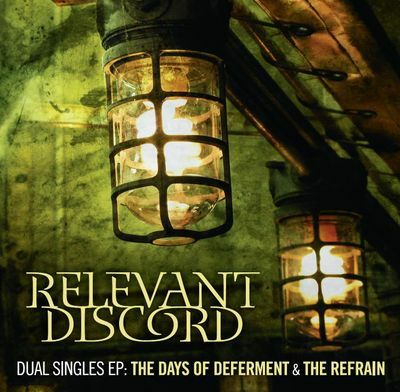 The result of the Massy/Veltrop collaboration is RELEVANT DISCORD's radio-ready singles: “The Days of Deferment” and “The Refrain” (a revision of the band's earlier effort). Both songs reenlist the talents of drummer Jai Callahan, and feature string work by Scott Fegette (cello) and Stephanie Lee (Violin). Both songs were mastered by Tom Baker (mastering engineer behind mainstream releases for Nine Inch Nails, Stone Temple Pilots, Avenged Sevenfold, 30 Seconds to Mars, Seether, Red, and countless more). “The Days of Deferment” and “The Refrain” appear on RELEVANT DISCORD's “Dual Singles EP”. The EP and both singles released on June 21, 2011 on both digital and physical platforms. Both tracks are being met with rave reviews and are quickly being added to radio station playlists across the globe.